Walk in the middle of nature, listen only to the noise of the birds and enjoy a unique landscape. That’s something at Hotel La Laguna Spa & Golf we’re used to. And we are thanks to that we are very close to one of the most beautiful natural parks in Spain: La Mata and Torrevieja Lagoons. Going there is one of the plans that you can not miss when visiting Ciudad Quesada. Do you want to know the curiosities of this environment? Keep reading! The wet extraction system of the salinas is practically unique in the world, not to mention that it is located within a natural park. While any other marine salt evaporates the water to collect the salt, in the lagoons of Torrevieja and La Mata it does not happen that way. Between the months of April and September the water becomes saturated with salts with the help of the temperature, which rises as the hours of sunshine increase. 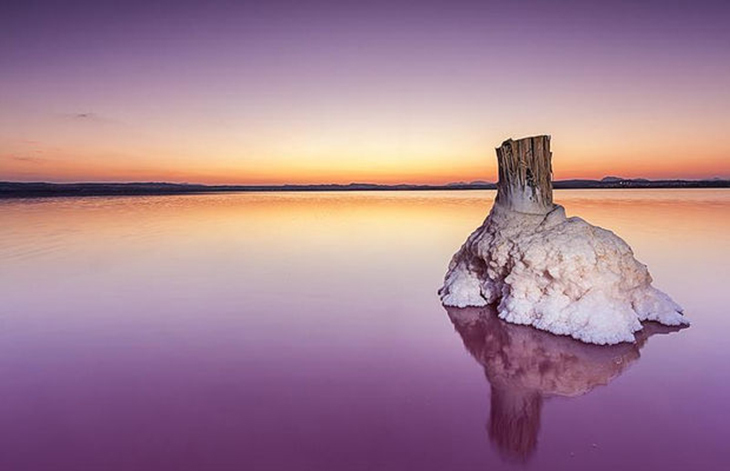 The salt precipitates at the bottom of the pink lagoon where it accumulates forming a layer that can be extracted throughout the year. To extract the salt, a unique technology is used. A mobile platform, equipped with backhoe motors and underwater caterpillars to move, scrapes the salt plate formed in the bottom with a shovel. The device is connected to the shore by a narrow dike more than a kilometer and a half in length, which is where the extracted salt flows. During the excursion through this environment you will find several viewpoints, great to observe the surroundings and the different aquatic birds that inhabit the salt marsh. In addition, it has integral reserve areas. During the summer the algae and bacteria that inhabit the lagoons multiply and dye the rose-colored water. The Lagunas de La Mata and Torrevieja have one of the largest populations of Flamingos in Spain.